If you filled in the blank, what would your dollar amount be? You would be surprised how many times Target shoppers gave the same response. In researching different retail stores, I asked this question to many times over the years. The top response (by far) was $100. There are different reasons for the $100 Target phenomenon and at the top of the list is an emotional attachment to the brand, and a love for shopping at the store. An interesting twist is this threshold answer is also pervasive on social media. 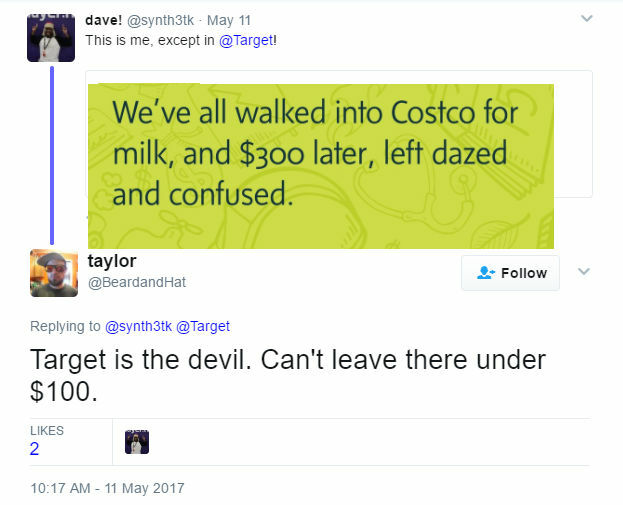 These social media posts give us further insight into why a shopper feels it is hard to leave Target without spending $100. There are various emotions with the dollar amount too. Some people are frustrated when they go over – others are exhilarated when they are slightly under. So why is it so tough to get in and out of Target under $100? Well, as you can see from the posts above, two contributing factors are Target’s Red Card and Cartwheel. These fuel the Deal Seeker who shops at Target. For the uninitiated, Target’s Cartwheel is saves shoppers anywhere from 5% to 50% on specific items. A shopper can also stack additional manufacturer coupons (if available) and use the Target Red Card (5% off purchases) for an even deeper discount. As of January 2017, 27 million Target customers were using the card. While the Red Card and Cartwheel fuels the Deal Seeker, there is something else enticing shoppers to spend over the threshold: impulse purchases. The store is designed to funnel the shopper to do a “circuit” (or a loop) around the store. As the shopper browses the circuit, they pass household product, beauty, grocery, outdoor, clothing … you get the idea. And at the end of each aisle is an end cap designed to get the shopper to purchase just one more item. Does it work? Definitely, for some shoppers. Do other stores have the same (or a different) dollar threshold? Maybe. The following posts eludes to a $300 threshold for CostCo shoppers, however, if the this is a consistent threshold no one is talking, er, tweeting it.